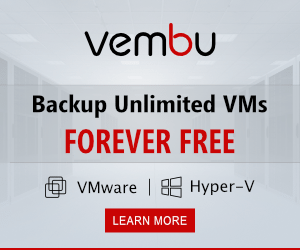 Installing VMware Tools on running virtual machines in a VMware vSphere environment is best practice and a great way to make sure the running virtual machines perform at their best. 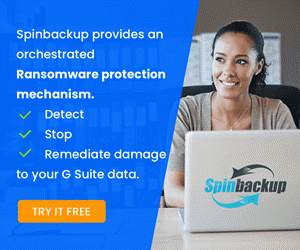 Having VMware Tools running as well is a necessary requirement for most modern data protection solutions that utilize VMware Tools as a means to perform “application aware” backups that allow applications such as Microsoft SQL Server to be backed up in an application consistent state. Generally speaking when you update your VMware ESXi host versions either via patches or upgrade media (i.e. 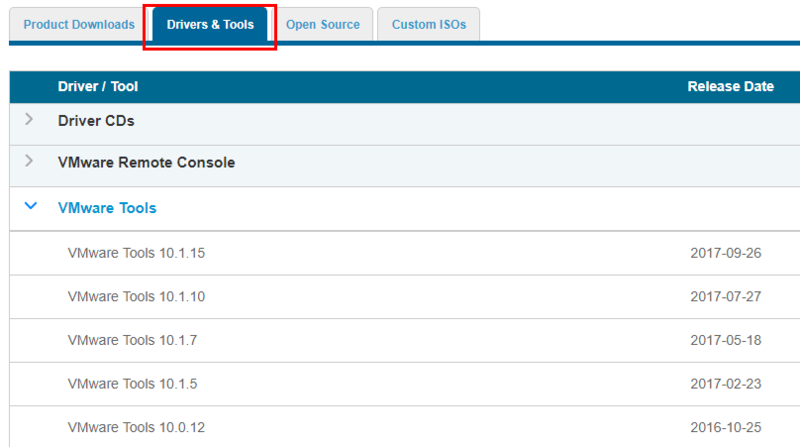 going from 6.0 to 6.5), there are VMware Tools upgrades available. Let’s take a quick look at how to Upgrade VMware Tools to Latest Version via GUI and PowerShell. Also, we will look at how VMware has decoupled the VMware Tools version from the version of ESXi. 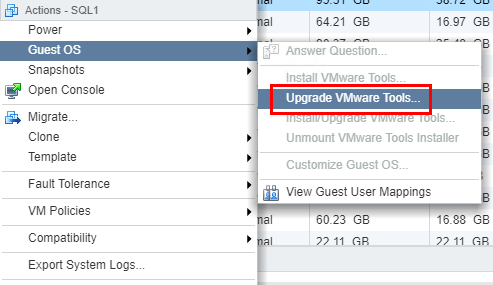 Perhaps the easiest and most intuitive way to upgrade the VMware Tools version is simply using the GUI. For the most part here, I will be showing the Flash client instead of HTML5. The functionality is there with HTML5 however, there are still a few views that don’t appear with HTML5. The first helpful bit with the web client is to show the “VMware Tools Version Status” column. To do this, right click in the default columns area, and you should see the Show/Hide Columns option. 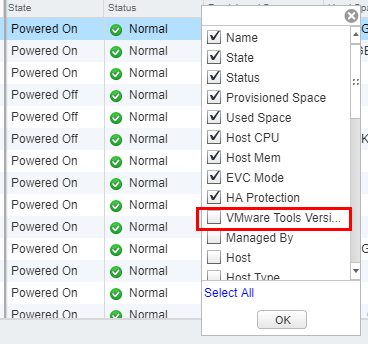 After clicking the Show/Hide Columns option, choose the VMware Tools Version Status checkbox. Now your VMs listing should have the column available and show the tools version and an indication of whether there is an upgrade available. 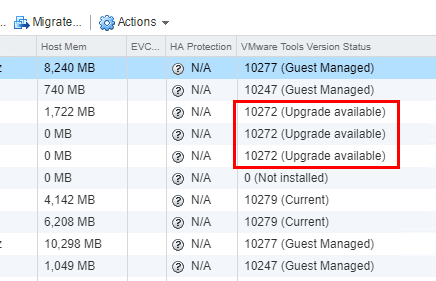 To upgrade any virtual machine VMware Tools version, simply right-click on the VM, select Guest OS >> Upgrade VMware Tools option. Interactive Upgrade – The interactive upgrade mounts the VMware Tools ISO and allows the upgrade process to be run interactively within the Windows guest operating system. Once we kick off the VMware Tools upgrade option, we can see the progress in the Recent Tasks window of the web client. 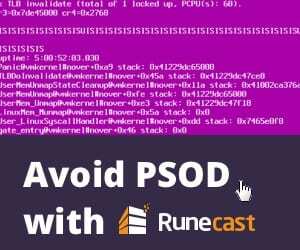 Above, we are passing the found VMs that need an upgrade to VMware Tools to the For loop and specifying the noreboot parameter and the runasync parameter which kicks all that need the upgrade off at once instead of serially working through each one. 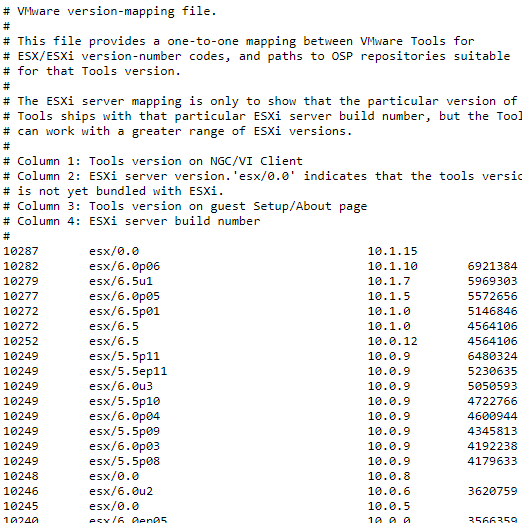 Starting with VMware Tools version 10, VMware has decoupled the VMware Tools version from the ESXi version. So in other words, you don’t have to wait for the latest VMware ESXi version to have the latest VMware Tools version and also virtual machines are not necessarily tied to the host for the VMware tools version. 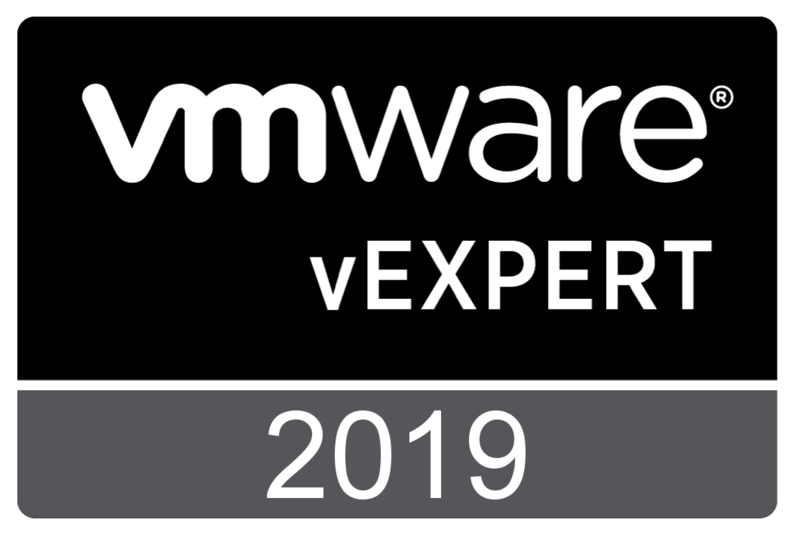 You can now download the latest and greatest VMware tools version directly from VMware and they are released asynchronously from the ESXi version. 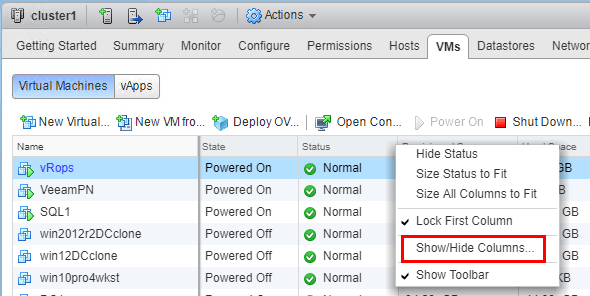 There is a great post from Brian Graf about setting up the Product Locker to serve as a centralized location to upgrade VMware Tools. This procedure shows how to setup the Product Locker method to provide the centralized repository for ESXi hosts which centralizes the VMware Tools upgrades, versioning, etc. 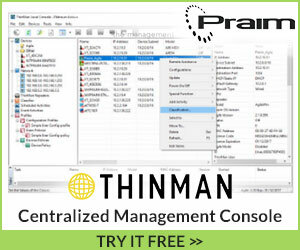 Be sure to check that out as this is a much better way of controlling VMware Tools moving forward. There are many good tools at our disposal to see the current VMware Tools version. One of those resources is the vmwaretoolboxcmd.exe utility that is found in the VMware Tools directory of a virtual machine that already has VMware Tools installed. Using this utility along with the “-v” switch, we can see the current version specifically. As shown above, we can see the Tools version as well as the build version. VMware has a very helpful VMware Tools Version Mapping file link that is publicly available to check VMware Tools version. Interestingly, you can see at the top the esx/0.0 listing next to the current 10.1.15 VMware Tools version showing the departure from the most current and a specific ESXi version. 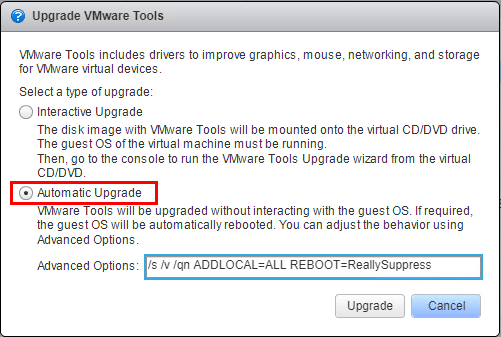 The process to Upgrade VMware Tools to Latest Version is easily done from both the GUI as well as using PowerCLI. 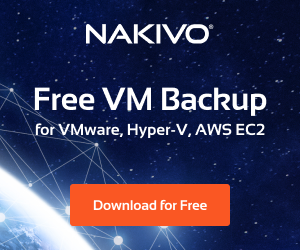 It is extremely important to keep VMware Tools updated and current as this ensures the virtual machine will run with best performance and stability during application aware backups especially. Using the new method for creating and maintaining a centralized ProductLocker location can help to keep all hosts no matter what version pulling the latest VMware Tools version for running virtual machines.